UPDATE: Hi, I'm backed! So here is the recipe from Yochana blog. 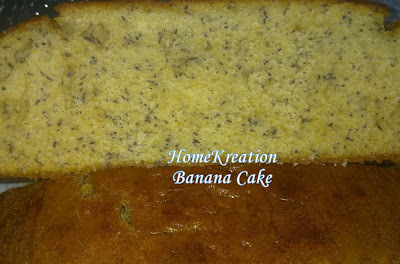 Since I had plenty of banana, was curious on the recipe which uses no fat at all plus egg whites only and such a simple & quick recipe, I gave this a try. The result was not bad and quite springy like marshmallows. Puree banana, sugar, egg white, milk in food processor until smooth. Add dry ingredients* and pulse just until blended. Don't over-blend. Note: Brownie is supposed to short in height. It reminded me of my Emak's request when I first saw this cake in Ros Onigiri's house. I have just finished baking the cake just now as I am going to visit my Emak tomorrow. The texture is light and it is very easy & fast to make this. However, my cake turned up a bit dry & bitter. So if I make again next time, I will reduce the bic soda & lower the oven temperature. The cake was cooked at 40 minutes instead of an hour. For recipe, please refer here. Little Liana posing a new dress from Auntie Suria... Auntie Suria gave her 3 pairs of dresses with paired shoes & the rest are yet to try.. love them all!!. 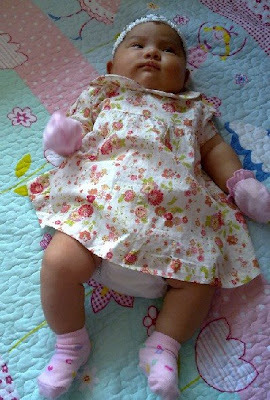 Thanks Auntie, I love this sweet dress... Mmmmmuah! 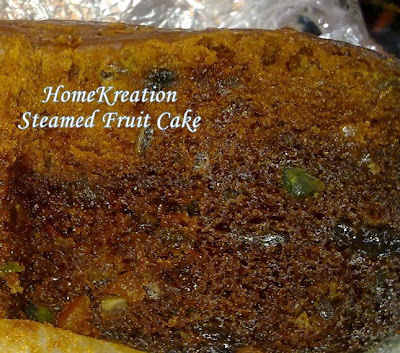 I'm going to my nephew's wedding this coming weekend and thought may be fruit cake will be good to serve during wedding preparation (gotong-royong) day. Tried the recipe from my sis-in-law's sister for the first time and no idea how it turns up as I couldn't slice it yet. She warned me not to publish her recipe... what a dilemma. Anyway, the recipe is similar to Diana's and methodwise I followed Diana's recipe & tips. Thanks Diana for the recipe and will let you know the outcome if I got a chance to slice it later. 1. Mix well mix fruit with 1 tbsp Flour (from the 600g above). 2. Beat butter & sugar until fluffy. Add in browning & essence vanilla, mix well. Add in egg one by one & beat with hand until just blended (do not over-beat to prevent cake of dry texture). Fold in flour mixture until just mixed. 3. Melt sugar in a pot with slow heat until foaming. Quickly but carefully pour into the cake mixture while stirring with wooden spatula. (It will get harden once touched the cold mixture, so fold in fast but not too worry if some crystallised caramel in the mixture). Finally, add in mix fruit (do not over-mix to prevent the fruit from sinking). 7. Pour into greased/lined 9-10 inch diameter cake tin. Steam for 4 hours above medium heat. This kuih is very popular in Miri but no one is willing to share the recipe. The cups are made from glutinous flour and it has sweet kaya filling. I'll be very grateful if anyone generous enough to share the recipe with me. If not, one day I will try to make this by trial & error. The above kuih were brought by my good friend Maria N when she visited my baby. The kuih is sold in many places in Miri or you can order from home-maker. 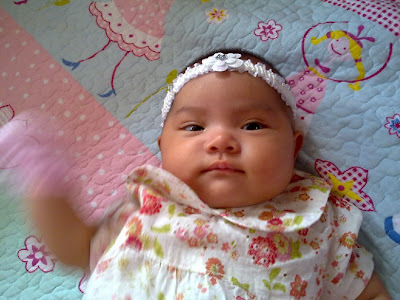 This video was taken when Little Liana was 1 month plus. See how clever my little baby who can response to movement & sound very well at that age. The crib hanging toy is a gift from very loving Auntie Jaja. Thanks so much Auntie and hope you will watch this video. Sorry you got to spin your head around in order to watch the video... hehehe. Don't remember when I cooked this. Must be one of the days when not much mood in cooking but I love the garlic fragrant. Heat up some oil & fry chopped garlic until crspy & dish up. Pour in tamarind juice, + salt, sugar & diced tomato. Pour sauce on top of fried fish. The recipe is adopted from cooking demo by Madam Tay organised by SWAN. I modified the pastry recipe a bit as I found them a bit soggy from the tasting sample. The result is crumbly & melt-in-the-mouth pastry. My tip to all --> do not overhandle the dough & no kneading necessary or else you end up with tough/soggy pastry. 1. Mix all ingredients, except marmalade,& rest for half hour. 2. Prepare pastry by mixing all ingredients until crumbly. Line greased pie tin with one portion & prick with fork. Bake 10 min at 170C. Roll the other portion & slice into strips. 3. 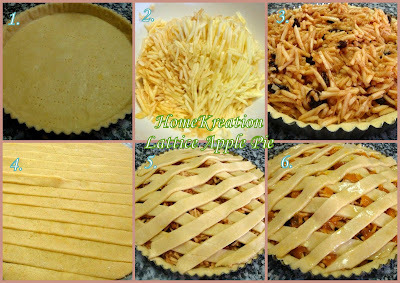 Fill case with apple mixture. Top with dough strips (see picture above). Drop marmalde into the opening between the strips. Bake 180C for 30 minutes. 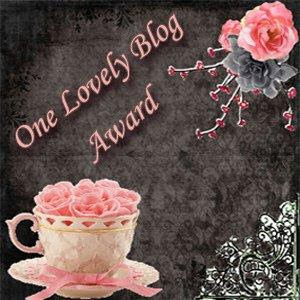 This lovely award is from Hani (Singapore), given while I was away but only managed to put it up today. Many thanks to lovely & sweet Hani for the friendly gesture. Mmmmmmuah..... & hugs. Little Liana sleeping soundly surrounded with toys, all from my generous friends received before & after the baby shower... many thanks for sharing the joy with me: There are many others that I did not manage to snap from yesterday event: "Tepung-Tawar" for me & baby with uttered well wishes, pink decorated cake gift from my GRA team, delicious food prepared by Cik Ja and pot-lucks from some ladies..... My heartfelt appreciation to all lady friends for such a wonderful party gift. Special thanks to Cik Ja who hosted and sponsored the party. Also thanks to Miss Lily, Cik Mala, Jeffrey & others who help to organise the party. 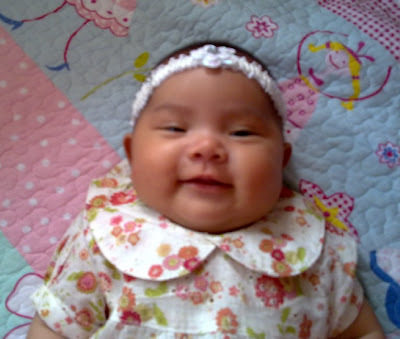 There have been overwhelming wishes and gifts from friends since the arrival of Little Liana. I was so touched with such excitement which people around me are sharing with our family. 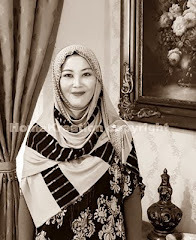 Indeed she is very special (so do my 3 sons) and her presence make a big different to us with special feeling after such a big gap (my sons are 18, 16 & 15). My husband, family & I thank all of you for such wonderful friendship. Also, I would like to thank all my cyber friends and visitors who dropped nice messages in this blog. Apology for unable to reply on each message as I am still struggling to cope with this new life. I love all my friends, whoever you are be it in real life or from cyberworld.... Mmmmmuah! Assalamualaikum & hello to all friends. Baby Rozliliana 2 weeks old: Latest photo: >1 month old: So now hopefully you all understand why neither could I update my blog nor visiting my cyber friends. It has been very hectic at home without any help at all. All my attention and priorities are my little cute precious baby girl. Things are a bit more settled down now with two helps from a live-in babysitter & an Indonesian helper who just arrived this week. So hopefuly you will hear a bit more from me after this. Miss all of you.... mmmmmuah!